Johnnie Walker Red Label, today, is a bottom of the line Diageo blend that is made for mixing into cocktails. I reviewed it last year and didn't like it straight at all. But Red Label exists in deep time - born of a marketing name change (from "Special Old Highland") back in 1909 - the year the iconic striding man logo was developed. This is also the year the Lincoln penny replaced the Indian head cent design. I have managed to get my hands on a number of samples of Johnnie Walker Red Label which occupy a range of periods from the 1930s through today. But this isn't that post. I started the tasting dead in the middle with a bottle that dates from the late 1960s to the late 1970s (I'm not certain which). It surprised and delighted me - shocked me really. Thus the stand-alone review. 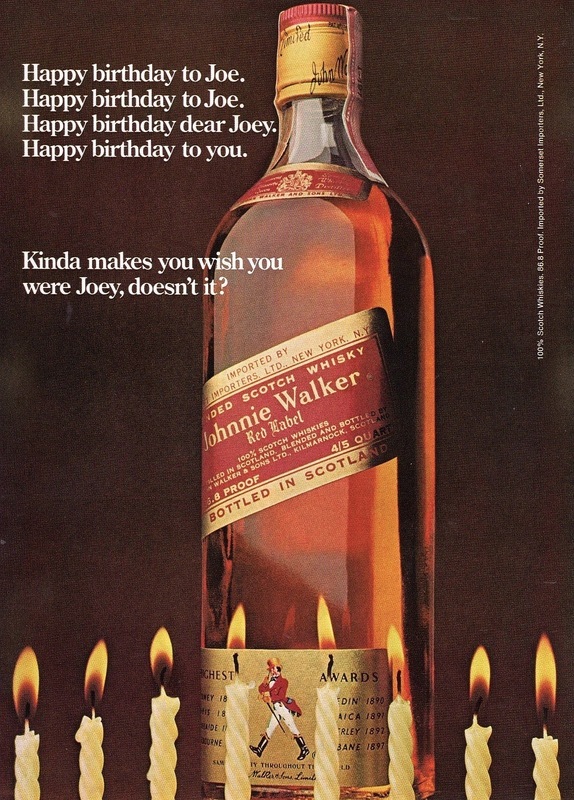 Dating a dusty Johnny Walker Red. 1) Is there a tax strip? They were discontinued in 1985. 3) Is there a UPC Code? They came into use, generally, in the late 1970s. So this bottle has a tax strip, uses avoirdupois (4/5th of a pint), and has no UPC code - so were' talking about a bottle that's from the late 1970s or earlier. You'd think a big clue would be the strength. Current Johnnie Walker Red is 40% abv. (80 proof) This is listed as 86.8 proof. Another potentially likely sounding clue is the importer: the front label clearly states "Imported by Somerset Importers LTD., New York, N.Y." This shows it's a US import and thus I know that 86.6 proof is US proof. However, a review of the advertising shows this on a multitude of labels with essentially identical style, importer, and 86.8 proof from 1967 through 1988. Ads from 1966 and earlier show the importer as "Canada Dry Corporation" not Somerset Importers LTD. Even earlier ads have different label details and start having cork closure. By 1992 we have the redesigned label and icon with the "phantom" walking man and a reduced proof of 40%. That's right, the proof wasn't reduced from 86.8 (43.4%) to 40% until 1992. 1966 ad. The same except Canada Dry Corporation is the importer. So where does this leave us with dating this bottle? It's somewhere after 1966 at the earliest and the late 70s at the latest (because of the lack of a UPC code) - and it's tough to be precise. So, bottom line, this is a late 1960s through late 1970s bottle of Red Label. I'm struck by the 1972 and 1974 holiday ads - which show the identical bottle (but 4/5 quart bottle). I have a feeling, aided by the provenance, that this is from the late 1960s to early 1970s - but it's a hunch. 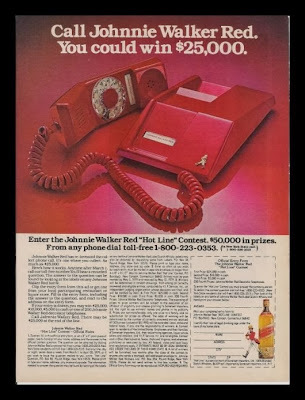 1979 "Hotline" ad - check out the awesome phone. 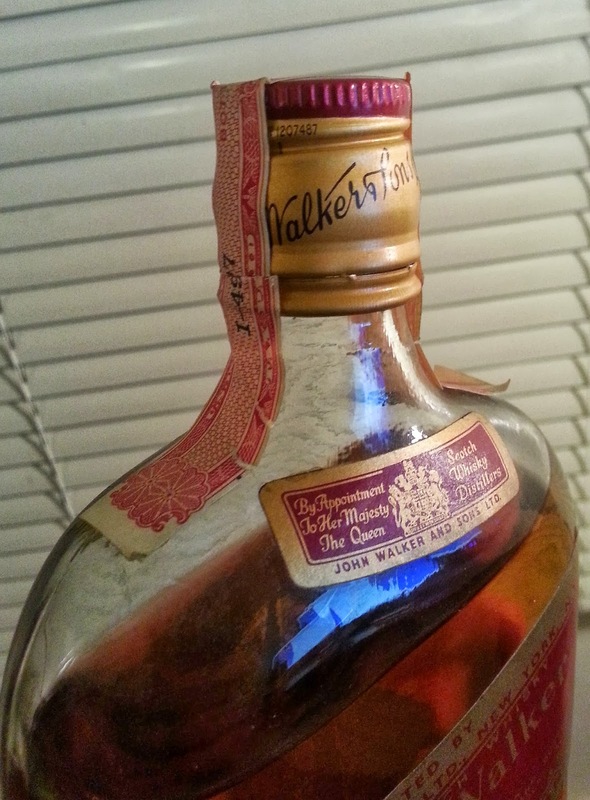 Johnnie Walker Red Label (late 1960s - late 1970s dusty) 86.8 proof. Nose: A shocking revelation: it's good. Really quite good. Highland honeycomb, floral heather, some fruity esters, and a distant complicating tang of coastal air, and a rich foundation of gentle smoky background peat. It's a rich and lovely Scotch nose - quite vivid. This has nothing in common with the current Red Label's nose. In fact it cleanly blows away most of the current Johnny Walker line and most regular blends. Palate: Heather honey, with the meadow florals showing through in the opening. There is a grain note in the opening too - but it's good grain whisky flavor, with notes of coconut and a bit of bubblegum. It adds freshness and complication to the Highland heather floral honey entrance. There are also hints of mint and pineapple. The mid palate blooms with spice overlaying a strong malt richness. The peat shows up here too in the spice and it waxes into a gentle and very well balanced waft of smoke as the midpalate fades into the turn. The finish is gentle, without bitterness at first, and moderately long. There is gentle oak and an array of sweet herbals and lingering gentle peat smoke. With repeated sipping a bit of bitterness and grain whisky milk tang builds up on the palate - prompting me to take drinks of water to clear it. Make no mistake. This is delicious and I could drink it all day long. It's rich and yet soft and easy drinking - compulsively, dangerously, easy to drink. At no point does this call out the imperative to be mixed into a cocktail. On the contrary it is a delight to sip neat. The grain whisky component is readily detected - but it plays along in a really nice way with the malt. I can feel the blenders art here and it's good. The star of the show is the rich honeyed floral nose and the presence of those flavors in the opening. The mid palate and finish, while fine, don't play at that level. But heck, this was (and is) the entry level expression. I'm really looking forward to tasting my old samples of Johnnie Walker Black! This is a shocking level of tastiness given where Red Label's flavor signature is at the moment. Has Whisky Become Better, Worse or Just Different? Klimek addresses the declining complexity of malt whisky and relates it to increasingly mechanized and homogenized manufacturing methods. 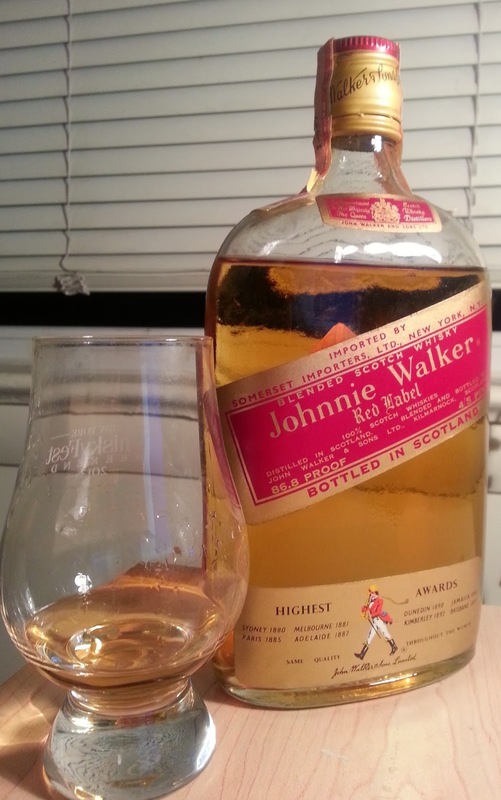 This old Johnny Walker Red is in a vastly different league then the current stuff - or a majority of blends up well over $50-$75 now. 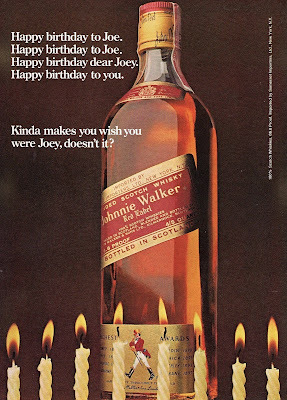 This was ordinary luxury Scotch of the time. Whisky was simply more complex and tasty in that era. Or does bottle maturation play a role? This will be an ongoing debate. But bottom line - delicious. I wonder when that stopped? Couldn't it simply be that there was much more malt whisky in the vatting in earlier periods and perhaps different groups and proportions of malt whiskies in different eras? I'm certain that's part of it. There was definitely more malt in the blend. But it was always NAS (very young) malt. Young malts today don't taste as rich and complex as even very young malts from the pre-automation era. Glen Grant used to sell a 5 year old expression, for example. A change in the proportion alone can't explain why old JWRL tastes so good. The components have to have tasted better too. Glad to see you brought up bottle maturation as a possibility, especially as I just read the spirited discussion in the MM&F group about it. I know nothing about it but it's pretty fascinating to learn. Also, very intrigued to see how the vertical plays out! You should come and do this tasting with me, Susannah. I'd appreciate the feedback as your young taste buds are more agile than mine. Exactly. And, frankly, I'm hopping mad about it. We're starting to see some boutique distilleries resurrecting the old ways. One example is Kilchoman. And guess what? Superb whiskies. Another example is a distillery that never stopped using the old ways: Springbank. And guess what? Superb whiskies. The big difference is that these practices weren't boutique in the 60s and earlier. They were all that was. I wish Diageo and the like would see that - but unless it hits them in the wallet there will be no incentive for them to think about it. Couldn't this be accounted for quite significantly by differing proportions of malt to grain in different blends in different eras as well as by a differences in the identities of the malts used? Occam's razor and all that. That was just me being asleep at the switch, Preacher, and having been forced by spammers to engage comment moderation. Sorry about that. Oh man. This JW geek is jealous. I wouldn't doubt there's a little paxarette going on, plus as you and MAO mentioned there's likely a lot more malt in the mix. Can't wait until you break into your ol' Black Labels. O...M...G... I bet you're right about the paxarette. I think I have a secret passion for it! I'm just glad that now I know what av·oir·du·pois means. Literally "avoir" = "to have" and "du pois" = "of peas" (as in the little round green vegetables). Having peas is a good thing... if you like peas. And I really really do. Particularly those crips sweet little baby ones. I wonder how many closed distilleries are in these old Johnny Walkers? 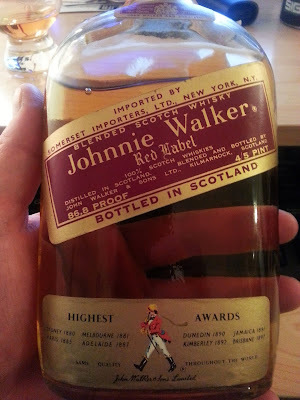 This Red Label probably had quite a few in the blend like Port Ellen or Brora. That's an awesome find. A number of years back I found two bottles of JW Black 12 year dated 1965. It's the best JW I've ever tasted. Not only did the old blends have a higher malt content, but there was a higher percentage of older whisky as well. These days, the stocks are monitered by computer and the age of the end product typically falls within a narrow range. 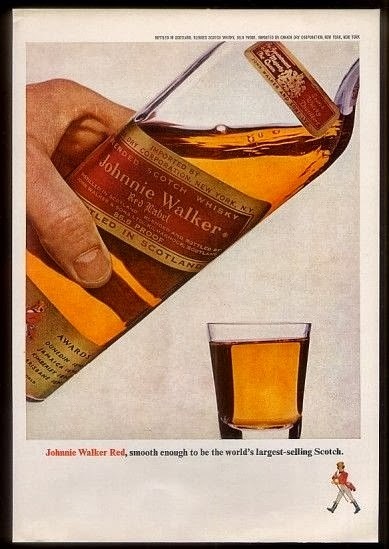 Going back to pre-WWII, JW Red was 8 years old (so was Dewars), but during the war, they couldn't consistently get the older whisky and did away with the age statement. Anyone tasted the Red Label Export Blend 45.8% alcohol limited edition currently available via duty free only? Apparently 'matured in European oak'. Ok. Since posting the above note about the JW Red 45.8% I have had the pleasure, thanks to my niece returning from the USA, to pick up two bottles of the 45.8% limited edition export blend from duty free. Can I say that this is about the first real review of this product that you, dear reader, will find on the net. My initial thoughts are, why would you make something that is crap to start with (the 40% version) into something that approximates cask strength crap? The immediate impression of this drink is a young (grainy?) spirit on the nose which reminds me of Dewar's White Label. On the palate there is sweetness derived from an almost overdone artificial caramel (added caramel perhaps?). I detected at one point, a little smoke somewhere, and it does have a greater indefineable intensity from what I remember the 40% version tasted like, but all in all, it is not enough to make this uncomplex drink interesting. I'd rather have spent the few dollars more on the JW Black label. Hi! Grandpa has a huge (it says 133 1.3 ounces) bottle of Johnnie Walker Red in a cradle thing. He's had it for about 50 years, because he decided to wait until in 90th birthday (this year) to drink it. Any idea of what it's worth? And will it taste ok? Thanks! This is marvelously helpful, as I recently came across a bottle of JW in my grandmothers basement. It's exactly the same bottle and label that you show and describe here. I'm glad to know it's (estimated) age! I can't wait to open it up (although I may save it for a special occasion since you describe it's quality as being far above the current standard). Since it's about half a century old, maybe ill just wait till it hits it's 100th birthday. Have an unopened,good condition bottle I stumbled on,any value/worth? It all depends on the details of the bottle - but the odds are against it being worth much. 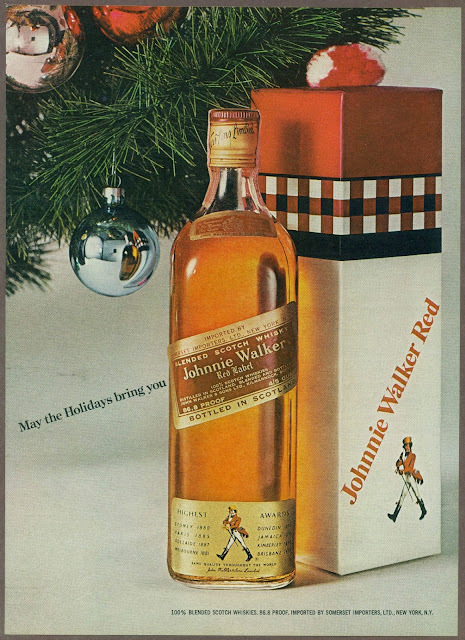 Johnnie Red isn't a high-status item (as a mainstream blend) and it was always too popular to be rare. However, I find it fascinating and delicious. If you send me a photo I'd be glad to estimate its age and value a bit more closely): josh(at)cooperedtot.com (where the (at) is an @ sign).